I found myself in New Orleans over the weekend. I’ve been here twice before, but neither time was to see the city; each time was to be a part of a more generic tourist horde. Once was in college when Mardi Gras coincided with Spring Break. A bunch of friends got together and all pitched in some sum of money that was almost a night’s stay. Then we packed ourselves – 6 if memory serves – into the biggest car we had drive the 10 hours from Atlanta. Space was limited so wardrobe was too. That wasn’t a bad thing since, given the general level of mess everywhere on Bourbon Street (the main Mardi Gras tourist party area), whatever you wore was sure to get ruined. If you’ve been you know what I’m talking about. I didn’t end up seeing much of anything outside of that debaucherous corridor. The second time I was here was for a bachelor party and the results were similar. Lots of booze, little sleep and not much scenery. Ended up missing my flight, camping out at the airport all day waiting on a standby seat, then staying the night to take the first flight out Monday morning. Strike two for me here. This time though the reason for the trip was not revelry, so I stood a good chance at getting to take in the culture. Walked down Magazine Street, a quiet shopping street. Magazine has mostly smaller shops, unlike so many other similar streets in other cities like Boulder or New York. But then those places don’t have a Bourbon Street. Grabbed a beer at The Bulldog which boasts over 80 beers on tap. 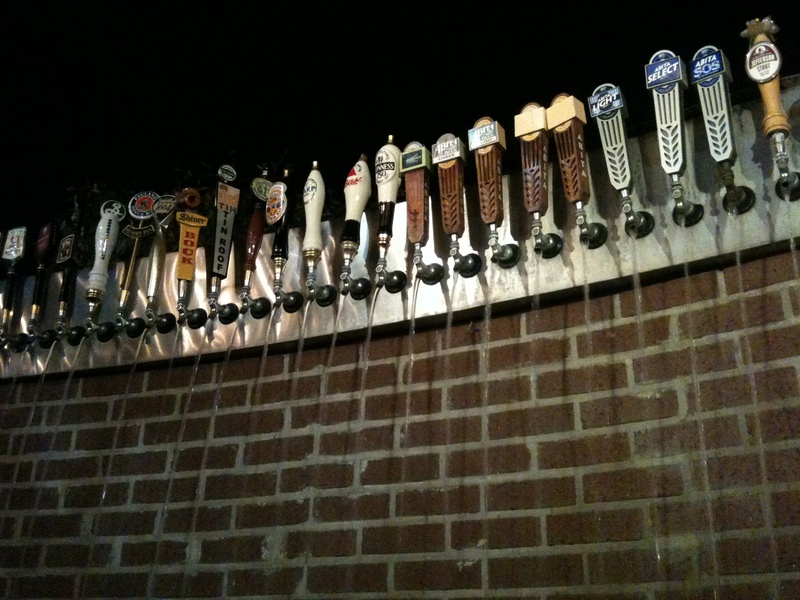 They also have a beer tap fountain on the patio. Even though I was stuffed I am a sucker for a good burrito. That’s how I found myself in Juan’s Flying Burrito. Great place, fantastic burrito. Found a place called the Circle Bar. Lots of people standing outside a house, amongst buildings where no house should be. Accidentally happened into front row seats for the concert about to start. That’s how I met Lips. She’s a singer in a band (Lips and the Trips) and invited me to come see her perform the next night at a coffee shop. So I said why not. They were good and got me into yet a different part of the town – equally as nice and quiet. Then I headed down Frenchmen Street. That’s an area of town where live music is squeezed out of every corner and cubby and mixes together like a cajun dish or creole language. Went to a place called dba on a recommendation and it was fantastic. Good jazzy blues band played and some great beers on tap and in bottle, including the fantastic Racer 5 from Bear Republic. All in all it was a great trip. I did make the requisite migration to Bourbon Street, but unlike a decade ago I found it didn’t interest me at all. It seemed just a smelly alley compared to the rest of the city. I know many people for whom New Orleans is their favorite city. And it’s growing on me too. It may not be San Francisco or Lasa, but it feels comfortable to me now. Just one good trip was all it took to wash away the iniquity of past lives there. So I’m looking forward to the next time I get the chance to head there. Posted on January 21, 2012, in USA and tagged america, bar, beer, burrito, circle bar, dba, juan's flying burrito, lips and the trips, magazine street, mardi gras, New Orleans, nola, the bulldog, travel. Bookmark the permalink. Leave a comment.